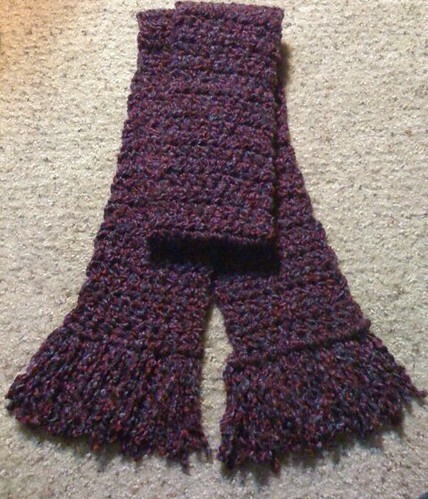 My favorite scarf to date, was the Berry Sweet Scarf. It’s really pretty, really soft, and the owner wears it constantly (which means it’s a fan favorite). The details: It’s about five-and-a-half feet long, half double crochet with about two inches of fringe. I used Loops & Threads Charisma yarn. All in all it only took about three or four hours to complete. I made another after this with the blue-green color and it is also pretty awesome.